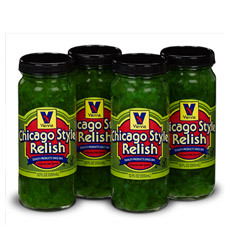 Neon green relish - a Chicago staple. This was originally published in the Left Hand Valley Courier as part of my Vicinity and Beyond series. As a Chicago native, I’m a sucker for any business – and particularly any food business – that claims a Chicago connection. When I spotted a restaurant named “Chicago’s Best” in Longmont, I had to try it. On the first visit to Chicago’s Best, my dining companion and I snarfled down Italian beef sandwiches with a side order of a Chicago-style hot dog and some fries. For those who have never experienced an Italian beef sandwich in Chicago, let me explain that it is probably not first-date food, because there’s no polite way to eat it. You could ask for a fork and knife, but you’d just get laughed at. The beef is sliced thin and piled high, the juice is abundant so the bread becomes quite soggy. Topped with sweet peppers, hot peppers, or both, it takes two hands to eat the sandwich, and possibly a shower afterward to hose off the juice that drips down your arms. I’ve been to places that claim to serve a Chicago-style Italian beef, but they all have some fatal flaw – either the beef is sliced too thick, there’s not enough juice, it’s not properly seasoned (it’s not a French dip) or the offered peppers aren’t done right. And the bread has to be right. If it’s on a bun, it’s not Chicago-style. Chicago’s Best scored high for having plentiful, thin-sliced beef, the right kind of bread and peppers, and plentiful juice. The only flaw was that the bread was grilled, or maybe toasted, so it was a bit crisper inside than a typical sandwich. It’s not a fatal flaw, since the fix is as simple as asking for the bread not to be toasted. A Chicago-style hot dog has a few variations, but typically you’ll find Vienna hot dogs, a poppy seed bun, and a choice of toppings including mustard, onion, neon-green relish, tomato, pickle, and maybe celery salt. Since neon-green relish doesn’t taste different than the regular variety, I can live with either. Toppings are a personal preference. But finding a Vienna hot dog nestled in a poppy seed bun in Colorado makes me smile. Chicago’s Best scored high in the hot dog category, with added points for authentic neon-green relish. Too stuffed to continue down the menu, we ogled the gyro rotisserie, and vowed to come back for a taste of that. And we did. A second visit scored a pizza and a gyros sandwich. Gyros meat is usually a combination of lamb and beef with some spices, and the “real thing” is a huge upside-down pyramidal construction that spins on a horizontal rotisserie. To serve a gyros sandwich, the cook slices off strips of the meat, and piles it on high pita bread, along with onion, tomato and tzaiziki sauce (a yogurt and cucumber concoction). Chicago’s Best also offered feta cheese on the sandwich, which I didn’t find typical when I was in Chicago, but it’s not as peculiar as finding lettuce on the sandwich. The gyros at Chicago’s Best also scored high on the Chicago-taste-bud scale. The only slight variation I noted was that the tzaiziki sauce had dill in it. That might be typical in other areas, and in fact an Internet search will find plenty of recipes that use dill, but in Chicago, the sauce is usually less herby. Taken as a whole, the gyros at Chicago’s Best were quite tasty, and my companion declared that the sandwich was better than another we had tried recently. That’s high praise, indeed. Last, we dived into the pizza. The crust was interesting and hard to describe. It wasn’t what I would call a typical Chicago crust by any means, but it was good. The toppings we chose, along with the sauce and cheese, made for a tasty pizza. But different. On the Chicago-taste-bud scale, the pizza didn’t score as high as the previous sandwiches, but my taste buds have developed a bit of a Colorado accent over time. Based on that, the pizza scored high, and it also passed the “next-day pizza-for-breakfast” test. The list of things I still want to try on the menu include ribs, Italian sausage sandwiches, sub sandwiches, Greek salads, and brats. There’s still more on the menu, but those will have to wait. The call of a well-made Italian beef sandwich is hard to resist.